Lisanne Skeoch has a vision for jewellery and wearables in our future that is both functional and fashionable. She went outside her comfort zone as a first time researcher at George Brown College and created something with her team that is new, innovative, fun and useful. Her premier research assignment at George Brown was working with RoweBots, testing and developing modular technology for smart jewellery. The research team took the approach of designing the prototypes for two specific consumer profiles. They would focus on the “Mother” and “Daughter,” representing women over the age of 65, and women between 45 and 65 years of age. Offering novel technological features, these bracelets could be digitally linked to one another, allowing for communication, and health and safety information to be passed between each device. 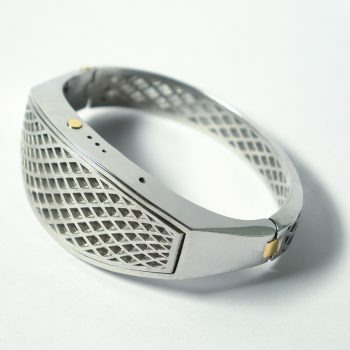 The bracelet would also have other features, not requiring them to be linked. Allowing for phone call or message alerts, reminders, call answering and ending, activity tracking, fall detection and interoperability with other applications, this bracelet would be a full featured accessory. Use of a smartphone application would allow for control of all of these features.